FatBoy Ice Cream | Holiday Flavor Spotlights – Peppermint and Eggnog! Holiday Flavor Spotlights – Peppermint and Eggnog! 12 Nov Holiday Flavor Spotlights – Peppermint and Eggnog! Nothing spells yuletide joy quite like favorite holiday flavors. So, you better keep watch on your grocer’s freezer section, and you better not cry when you get the dessert assignment for your next holiday party, because Peppermint and Eggnog are coming to town! When it comes to the holidays Peppermint is a must. It all started with the candy cane and now it seems Christmas’s signature flavor is peppermint. We’re all about any excuse to join your family’s festivities and store ourselves in your freezer this fun time of year. That’s why Casper’s took the cool refreshing flavor of peppermint combined with our ice cream blend you’ve come to know and love, then wrapped it in between two chocolate wafers. Call it tradition. Call it Christmas magic. Or call it as you taste it: Delicious! A box of peppermint FatBoy Ice Cream sandwiches makes for a refreshing party treat after a rich and heavy feast. Or hey, you have our permission to grab a FatBoy after a busy evening of wrapping, and enjoy your very own ice cream sandwich while you have yourself a moment of solitary bliss. You deserve it. Why Eggnog around Christmas time? The answer is wrapped in history and tradition–two things we at FatBoy pride ourselves in. We say, mix it up this year and enjoy your favorite holiday indulgence in frozen form! Instead of sipping eggnog by the fire, you can savor our eggnog-flavored ice cream blanketed in between two crispy graham wafers. Our creamy eggnog concoction has a hint of nutmeg, and the familiar homey taste you crave this time of year. It creates the perfect ending to any holiday get together. Happy nogging FatBoy people. While we love the holiday season, we’re not immune to knowing the stress that piles up this time of year. What with gift buying, tradition-chasing, present wrapping, and holiday parties, it can be hard to Ho Ho Ho through it all. At your next holiday party, alleviate some of the stress and let us cover dessert. 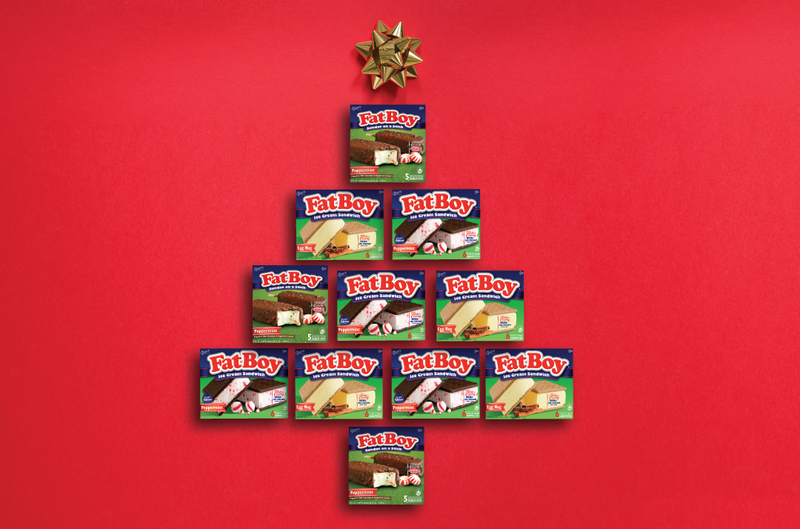 There isn’t a more simple dessert than opening up a box of our creamy delicious Fatboys. Your guests eyes will light up when they see not only did you bring the FatBoys, but the festiveness of the flavors will leave you looking like Santa’s Super Star Helper.